The men’s lacrosse team at Youngstown State University is getting set for their upcoming season. With a number of big games and players, they are eyeing a national championship once the season gets started. The team, led by co-president Gordon Ngo, a senior majoring in civil engineering, has a lot of potential and they look to make it all the way to the national championship this season. The team is only a club now, but seeks to become a varsity team in the NCAA soon. They will have multiple chances to prove themselves as they play a variety of teams across Ohio. 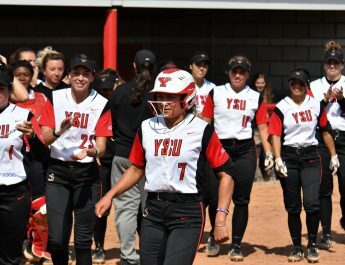 Some of the bigger opponents they face this fall in exhibition games include The Ohio State University, Kent State University, the University of Akron and others. They will also play against Western Pennsylvanian teams including Edinboro University, Allegany College and Slippery Rock University. Ngo said the team tries to travel outside of the state for opportunities to face-off against teams they aren’t normally equipped to playing, such as Marshall University in West Virginia and the University of Louisville in Kentucky. The start of the regular season begins next spring, but they are currently practicing a few days a week while scrimmaging teams from all over the state. While they might not be getting as much practice as other teams, the Penguins are still optimistic about the amount of skill they will have to be able to matchup against their opponents. Mark McKenzie, a junior astronomy major, said he is excited to play against a school like OSU. He thinks the team looks improved from past years and likes the direction they’re headed in. McKenzie said he joined the lacrosse club because he had been playing since high school and he and the rest of the team had good chemistry from the start. Ricky Koewacich, a senior mechanical engineering major and co-president, thinks it is a an excellent opportunity to play the bigger schools. “I had a knack for the sport immediately and learned faster than most new kids,” said Ngo. Ngo became co-president of the club during his freshman year of college. He says that he wasn’t ready, but the then current president noticed that Ngo seemed to have more time. “Being thrown into it was crazy, but I learned as I went,” Ngo said. “The players are really nice and friendly, but serious when it’s game time. It’s a fun time,” said Koewacich. Koewacich had never played lacrosse before joining the program. He thinks the team is quickly growing and he has been there to help grow it to a 25-member club.